Ink used for lithographic offset presses is a paste, rather than a fluid. That means it is thick and tacky.It is typically delivered in canisters. The image below shows Quattro offset printing inks from 4S Graphics. The ink vehicle is the fluid part of the ink that transports the pigment onto the substrate. This is typically an oil based material. The pigment is the part of the ink that imparts gloss, color, texture, and other characteristics to the printed image. Pigments can be black, white (either opaque or transparent), and colored. The colored pigments are usually produced from either mineral sources or from derivatives of organic coal tar. 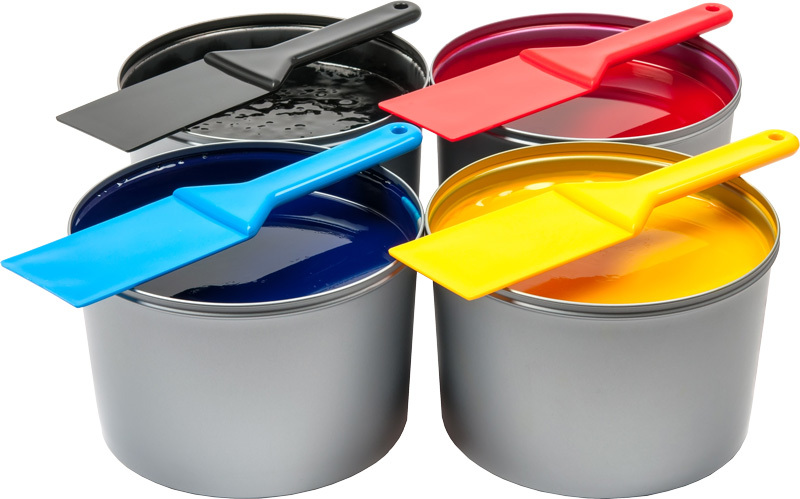 Other materials such as metallic powders are used for specialty inks. Various additives influence the characteristics of the ink. Driers speed up the drying of inks. Bodying agents increase the viscosity. Waxes help prevent printing defects like ink setoff and blocking and they increase the scuff resistance of the ink. Other materials are added to reduce the ink’s tack, improve its distribution on the printing plate, prevent oxidizing and enhance other properties of the ink. Web offset inks tend to be more fluid and have less tack than sheetfed lithographic inks. Most offset inks dry rapidly without the need for additional equipment, but there are also inks optimized for infrared, ultraviolet or electron beam curing. All offset inks contains water-repellent materials, needed because offset lithography is based on the fact that oil and water do not mix. Since offset presses can print on a wide variety of surfaces, a large number of inks are available for the process. This YouTube movie shows how it’s manufactured. Regular process inks or spot color inks can have unique properties. They can be extra glossy, resistant to abrasion, low-odor, dry fast under UV light, etc and of course, they are usually optimized for a specific printing process and/or type of substrate. There are however also special inks. These are often used to make advertising material, packaging and labels stand out. Some of them are used for security purposes. These inks either change color or become transparent when temperatures increase or decrease. There are inks that will keep changing color or transparency and others that will only change once. Thermochromic inks are used in toys, battery indicators and some types of thermometers. They are also used frequently in packaging, to show commercial messages or to indicate if the packaged product is warm or cold enough. These inks have a metal-like character. They contain metallic particles that rise to the surface after printing, reflecting light and creating a metallic sheen that simulates zinc, copper, gold or silver. Inks that aim to create a metallic sparkle effect are called glitter inks. Mirror inks are a special kind of metallic inks. When printed on the reverse side of a transparent substrate like glass, polyester or poly-carbonate you achieve a mirror effect. This can be done with offset but also with screen printing. The metal oxide based pigments in these inks give a characteristic gloss to the printed image that is comparable to the iridescent gloss of pearls. As the name implies these colorless inks imitate a watermark. These inks give off a scent when the printed surface is scratched. The inks contain tiny nano-sized particles that encapsulate a fragrance. Scratching the printed surface tears open the capsules so that the scent is released. Instant win lottery tickets have a thick layer of scratch-off ink applied. Scratch off ink is also used to hide secrets codes for contests on beverage cans or other types of packaging. First a release varnish or UV coating is printed and then the scratch-off ink layer is printed on top. This can be done with screen printing as well as offset lithography. In offset you may have to print multiple layers to get a good result. These inks are used as a security measure on checks and other high-value documents. They contain particles of a magnetic substance whose presence can be detected by magnetic sensors. A counterfeit copy produced using regular inks will not pass a validation by a MICR (magnetic ink character recognition) reader. These have two completely different uses: Luminescence security inks, which are sometimes called marking inks or UV/IR excitation inks, light up when exposed to ultraviolet or infrared light. They are used as a security measure on banknotes and other high value printed documents. A bit more frivolous are photo luminous glow-in-the-dark inks, which temporarily emit a weak light in the dark. More information on inks is available on this page. i want to buy your product – peony processing printing ink to Ghana. i need the price quotation. I think you misunderstand the purpose of this site. I do not sell inks or other print related products. Also i wanted to know as while printing we get variation in the shade in the final results on the substrate. Can something be done so as to get uniform print with uniform shade over ghe substrate eg. Film or paper or paperboard. Can you suggest some measures by which it can be controlled. I am not the most suited to answer such a question because there may be a wide range of reasons why tints are not uniform and I have no practical knowledge of troubleshooting such problems. The plates might cause this if they are not uniformly exposed and developed. The inking mechanism on the press, its ink keys, non-uniform pressure or deformed rollers may all be reasons but how you determine the exact cause is beyond me. The question is better asked to your press vendor or posted on a specialist forum like printplanet.com. Hello sir my name is uttam and i have gone through your page for printing ink for offsett. I had a doubt as why a repellent agent is used in this process eg. Water and oil. Why only ink cannot be used and print directly. Is it a compulsion to mix it with oil and water. Would be verry helpfull if you could help me with this doubt.